New offerings, platforms prove company knows how to adapt to changing market. One to watch: Netflix (NFLX) joined an expanding cohort of companies to exceed earnings expectations: The DVD rental outfit posted a second-quarter profit gain of 22%. Wallet-watching is a big factor for consumers assessing entertainment options in a recession, and it benefited from cocooning clients crashing on the couch after ordering online. Subscribers topped 10.5 million, and the stock is up almost 60% in 2009. America's largest mail-order movie service carries over 100,000 titles and inspires enormous devotion among movie buffs searching for that long-forgotten Fellini first cut. There's some concern over churn, and the firm famous for its red envelopes faces fast-growing competition from Redbox (CSTR), operator of DVD kiosks which offer daily rentals for a dollar. But Netflix appears aware the industry mantra is adapt or die (Betamax, anyone? ), and it's expanding product offerings and platforms, especially with instant Internet streaming. Continue to evolve, and it could give investors a Hollywood ending. 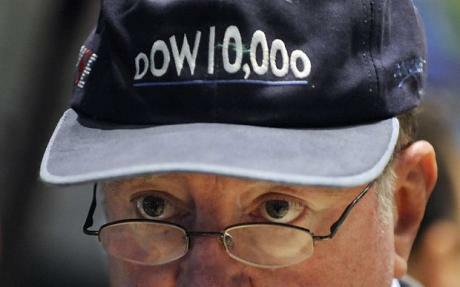 What just happened: Stocks jumped, sending the Dow Jones Industrial Average above 9,000; much more of this, and those decade-old Dow 10,000 hats can be dusted off. ("But is it Art?" I hear you ask. Yes, that was indeed a cap-clad Mr. Cashin). Still, investors should refrain from having the champagne, with Microsoft (MSFT), Amazon (AMZN), and American Express (AXP) all posting sub-par earnings. American Express may want to follow the lead of archrival Visa (V) by billing $23,148,855,308,184,500 for train tickets -- a troubling trend. And Off-Track Betting is but the latest organization apparently heading ominously towards bankruptcy. What's happening: I'm willing to gamble, if not on OTB, that readers will be shocked --shocked to learn of corruption in New Jersey, a topic both the New York Times and the Wall Street Journal deem worthy of top-story status today. Asia ended up again with South Korea heading north for a ninth successive session. Europe is on course to go one better; stocks on the continent set for a tenth day of gains -- even amid ominous economic news from across the English Channel, with Britain posting an unprecedented drop in GDP. Futures are indicating a flat-to-lower open. and on CNBC this morning, Warren was skeptical about the strength of economic recovery. What will happen: Burger-flipping adolescents everywhere rejoice as the Federal minimum wage increases $0.30 to $7.25 an hour. Also heading higher, according to experts, is July's University of Michigan Consumer Sentiment Index when the revised reading is released at 9:55 a.m. Eastern time. We'll be learning about earnings from Arch Coal (ACI), Ashland (ASH), Black & Decker (BDK), Dover (DOV), Exelon (EXC), Fortune Brands (FO), Ingersoll-Rand (IR), Schlumberger (SLB), Sepracor (SEPR), and T. Rowe Price (IRPAX). Happenstance: Poor Pele. If the greatest-ever exponent of the world's most popular sport is pleading poverty, what hope is there for the rest of us?